Fed up with a cruel and corrupt leadership, Kenyans across the social divide are planning to express discontent during Jamhuri Day (Independence) celebrations on December 12th. A past demonstration along Nairobi's Moi Avenue. The plans are as varied as the number of groups in the country. There are those calling for a White Ribbon campaign, where everybody attending Jamhuri Day rallies puts on a black shirt and white ribbon as a silent protest. Then there are those calling for a total boycott of Jamhuri celebrations so that Kenya’s big-mouth politicians face empty stadiums. Debate is raging on whether to advance the boycott to include shunning voting come the next General Elections. One thing is certain though: a major showdown looms between the politicians and the concerted power of the people. Indeed, the kind of discontent being witnessed in Kenya today has resulted in the toppling of governments elsewhere in the world. The Kenyan government can take solace in the fact that a uniting personality, such as South Africa’s Nelson Mandela, Russia’s Boris Yeltsin or Poland’s Lech Walesa is yet to emerge into focusing the people’s anger towards tangible action. The White Ribbon campaign is championed by the Mars Group, an anti-corruption body associated with Mr. Mwalimu Mati. Mars wants peaceful mass action as opposed to revolutionary tactics. 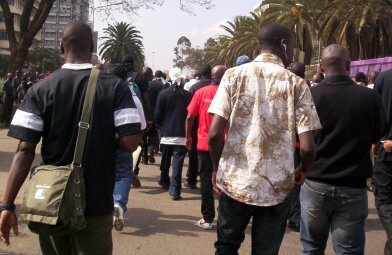 Mars Group is urging all Kenyans to attend Jamhuri Day celebrations dressed in black T-shirts and white arm bands as a show of solidarity against a thieving political class. Kenyan legislators, judges, diplomats and other office holders have flatly refused to pay tax, even as they enjoy exaggerated pay. The President of Kenya earns almost as much as the United States president or the British Prime Minister even though Kenya is at the bottom of the development ranks. Furthermore, Mars Group is mobilizing Kenyans to boycott paying taxes, considering that 85% of the national budget is used to fund a bloated cabinet, paying entertainment allowances, buying luxury cars and building offices. Only 15% of Kenya’s budget is left for roads, water, electricity and health care systems. To add to the pain, Kenyan politicians have been implicated in the worsening shortages of maize, wheat and sugar. Prices have risen dramatically in the past couple of weeks after politicians took up all the supplies at the National Cereals and Produce Board (NCPB) in order to sell to millers at 26% profit. Prices of maize are getting outside the reach of Kenyan families. Consequently, hunger looms as the Christmas festivities draw nearer. Each month Kenya Shillings 102 million (US$1.3 million) will be spent on household and press services for President Kibaki, Prime Minister Raila and Vice President Kalonzo, which is more than the funding for roads nationwide. Kalonzo will get 100 million shillings ($1.2 million) for travel this year while people are starving in Ukambani. Raila’s household funding is more than the money allocated for slum-upgrading. The Kenyan government is not likely to take the prospects of people power lightly and there’s a strong possibility of riot police being unleashed to cause disruption. Due to these fears, there are voices calling for a total boycott of Jamhuri Day celebrations. According to one blogger, walking into stadiums wearing black T-shirts and white ribbons would mark oneself as a target by riot police, with the prospects for arrest. A boycott of the celebrations would certainly send a wake-up call to the government to change its ways. Considering that Jamhuri celebrations are usually covered by the international media, the spectacle of an empty stadium will be too embarrassing for the government. It will show the politicians that Kenyans can chart their own destiny and are no longer willing to be used as sacrificial lambs to advance political careers. As Kenyans have been asking, what was the point the violence witnessed after elections, yet the politicians are quick to unite when oppressing the people? There is bitterness among the Kikuyu ethnic group with President Kibaki for urging forgiveness for the perpetrators of ethnic cleansing. The Kalenjin are disillusioned with Prime Minister Raila Odinga for not appreciating the community’s role in forcing Kibaki to the negotiating table. At least 1,000 people died in political and ethnic clashes between January and March this year. Hundreds of thousands of others are still living in refugee camps as its too dangerous to return home. Peace talks that ended the post election violence resulted in the current coalition government with Kibaki retaining the presidency and the new post of Prime Minister created for Raila. Though Raila enjoys fanatical backing amongst his Luo tribe, many are of the opinion that he is not fulfilling his campaign promises. Last week, residents of Raila’s constituency in Langata ambushed a visiting United Nations delegation to protest rising food prices. Such is the sense of helplessness among Kenyans that the turnout in the next elections will be the lowest in history. It would be interesting because the voter turnout in the 2007 polls was the highest ever recorded since independence in 1963. However, the 2007 polls were messed up so badly that the actual winner will never be known. For this, the government, the Electoral Commission of Kenya and politicians are to blame. None of the competing parties had any intention of conceding defeat. An election boycott would be a sign of frustration with Kenya’s politicians. Whoever becomes President, or Prime Minister, will only manage a few thousand votes. There’s growing realization that only concerted action by Kenya’s citizens will save the country from destruction. Unless action is taken, the next General Elections scheduled for 2012 could be the end of Kenya as we know it.